No matter how big a success your party was, unfortunately the morning after comes very quickly. And even quicker it strikes you with the realization that after days of planning and preparation for the event and all the stressing about if everyone is having fun throughout the actual thing, it is too early to think that you can rest. That is, unless you get our cleaners to give you a hand with the after party cleaning with Cleaners Liverpool! Have no doubt that our certified cleaners are going to do great job. They have the experience, skills and equipment to handle even the biggest of messes and you will not have to worry about a thing. If you are organizing a party at your home or at a rented venue, you have enough things on your mind. Handling the post-event cleaning would be the last thing you would like to worry about. So just leave it us to come to the place the morning after. We will clean, de-clutter and collect all junk. We will pay special attention to the high traffic areas in every party – the kitchen and the toilets, but naturally we will make sure not to miss a single spot. In the end, the results that we are going to achieve would be up to all your needs and expectations. Not to mention that they will come at a great price too. An after party cleaning in Liverpool service from our company would be a good solution for your corporate event as well. You will be spared from one duty on the list at least, and you will have more time to prepare and concentrate on the important matters – the goal of the corporate party/event in question. We will do a professional job cleaning and sanitizing the premises once everything is over. In all cases, our expert cleaners use the latest equipment and highly efficient cleaning products designed to offer immediate and immaculate results in commercial cleaning as well. We know how to do our job right. The positive testimonies from our clients are one way to prove that. But of course, the surest methods is to simply let us show you how we work. 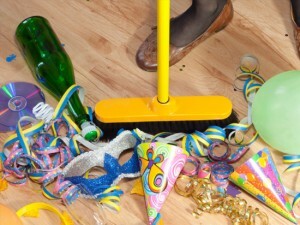 You can contact our customer support for booking an after party cleaning in Liverpool and to request a free no obligation quote at any time of the day and night. Our line is open around the clock and our support team can also be reached via the contact form on our website. Get in touch now. Do not forget to ask for your free quote today.